Pope Francis yesterday urged Christians to be friends with Jesus whose love, he said, is faithful, even to those who betray Him. Source: Vatican News. 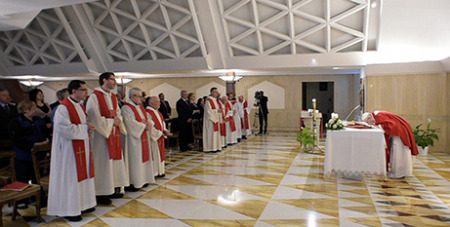 We have received our friendship with Jesus by "lot" – that is by destiny, not by chance – and our vocation is precisely to remain friends of the Lord, Pope Francis said yesterday in his homily at Mass at the Vatican’s Domus Sanctae Marthae residence. The Pope based his reflection on the word “lot” that occurs a few times in the day’s Mass readings and a prayer on the feast of St Matthias, who was chosen by lots to fill the place of Judas Iscariot who betrayed Jesus. The Pontiff said we have received this gift of friendship with the Lord as our destiny, and our vocation is to live as His friends. All Christians, Francis said, have received this gift of friendship, which the apostles received to a “stronger” degree. It is a gift that the Lord always cherishes, faithful to this gift. Many times, however, the Pope explained, we are not so faithful and distance ourselves from Him "with our sins, with our whims" but Jesus is “faithful to his friendship". In the day’s Gospel, he said, Jesus no longer calls us "servants" but "friends" and keeps His word until the end because He is faithful. The last word to Judas before his betrayal, the Pope recalled, was "friend" and not “get out”. However Judas chose his new destiny freely, distancing himself from Jesus. The Pope called this apostasy – when a friend turns an enemy, indifferent or a traitor. Even those who distance themselves from Him, Francis said, Jesus always awaits, faithful to his friendship. He urged Christians to ask Jesus for the grace to remain in his love, in his friendship.